Jenny Everywhere points a gun at her head. 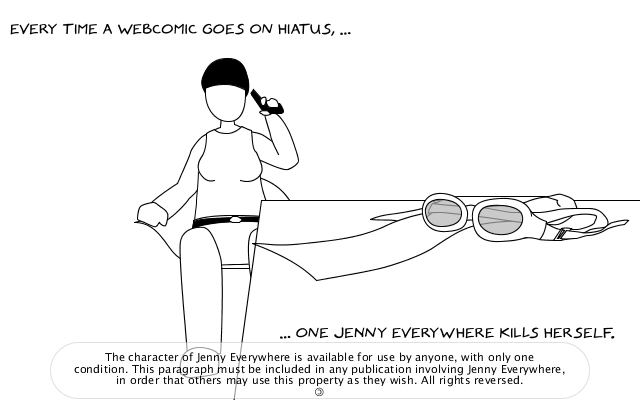 Text: Every time a webcomic goes on hiatus, … … one Jenny Everywhere kills herself. Text: The character of Jenny Everywhere is available for use by anyone, with only one condition. This paragraph must be included in any publication involving Jenny Everywhere, in order that others may use this property as they wish. All rights reversed. Um, yeah, I’ve decided to take a break. But I do this to have more time for other things, so I won’t really have a break. In case you haven’t noticed it yet, I’ve got an RSS feed now. Unless you use Piperka, be sure to add tragicomics to your feed reader so you don’t miss it when I update again. Also, my first published Jenny Everywhere artwork. ☺ I invite everyone to use this comic’s idea for their own hiatus announcements. I’m trying to start a meme here! (I hope this will be more successfull than the writing “one or two” instead of “<3” thing.) If you don’t have any hiatus announcements to make, then go check out The Shifter Archive to learn more about Jenny Everywhere.